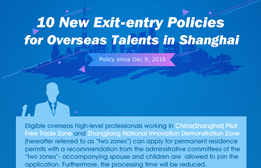 The modern service industry sector enjoyed fast development in Shanghai in 2015. The added value of the city’s information services industry totaled 137.45 billion yuan, up 12.0 percent from 2014. Emerging industries also showed sound development, with added value accounting for 15 percent of the whole city. The sales volume of non-store retailing reached 125.06 billion yuan, 26.9 percent higher than 2014 and accounting for 12.4 percent of total retail sales of consumer goods in the city. As a national transportation hub, Shanghai completed the transportation of 912.39 tons of cargo in 2015. The total number of passenger transportation reached 185.71 million, 7.9 percent higher than 2014. The number of flights departing and arriving at Shanghai Pudong and Hongqiao airports totaled 705,800, up 7.7 percent compared with 2014. The number of passengers inbound and outbound reached 99.19 million, 10.6 percent higher than 2014. In 2015, the city optimized 280 bus routes and added 40 kilometers of metro lines. The total length of metro lines in the city has reached 617.53 kilometers. In 2015, the total volume of postal and telecommunication businesses totaled 3.86 billion yuan and 78.03 billion yuan respectively, 24.2 percent and 30.5 percent higher than 2014. As of the end of 2015, the number of fixed-line telephone users in Shanghai reached 7.93 million. The number of mobile phone users reached 32.6 million, 22.1 million of whom were 3G and 4G users. In 2015, the total commodity sales volume reached 9.34 trillion yuan, up 6.4 percent compared with 2014. The total retail sales volume of consumer goods exceeded 1 trillion yuan, with a growth of 8.1 percent compared with 2014. Online retail sales reached a volume of 109.14 million yuan, up 31.6 percent compared with 2014 and accounting for 10.9 percent of the total retail sales of consumer goods. Shanghai has strived to construct an international financial center with a cluster of financial institutions offering services in stocks, bonds, insurance and futures. In 2015, the added value of Shanghai’s financial industry totaled 405.22 billion yuan, up 22.9 percent compared with 2014. As of 2015, the total number of financial institutions in the city reached 1,430, including 618 for monetary financial services, 350 for capital market services and 382 institutions in the insurance sector. The number of foreign-funded for-profit financial institutions totaled 230. Total property investment in Shanghai reached 346.89 billion yuan in 2015, 8.2 percent higher than 2014. The total construction area of commodity housing reached 150.95 million square meters. The sold floor area of commodity housing reached 24.31 million square meters, up 16.6 percent from 2014. In 2015, the cargo throughput of Shanghai port reached 717.4 million tons and the international container throughput reached 36.54 million twenty-foot equivalent units (TEU), ranking first among global ports for a sixth consecutive year. As of 2015, Shanghai has established relationship with 23 cities around the world, including Osaka and Yokohama of Japan, Seattle, New Orleans, New York and New Jersey of the US, Antwerp of Belgium and Marseille of France. In 2015 the city held 851 fairs and exhibitions, with a total display area of 15.13 million square meters, up 22 percent compared with 2014. 292 among them were international exhibitions.